Hello Cookie Lovers– When Larry and I were first married, we lived in a tiny student housing apartment. Every Saturday I would grocery shop first things with a carful of other student wives. We’d drive to the market, sharing meal ideas and making our lists. Then back home, I’d clean the small apartment, which took about an hour top to bottom. And in the afternoon, bake cookies– a big batch, every week. After 40 years, we are off our weekly cookie diet. But now and then, friends coming in does call for a big plateful of cookies. 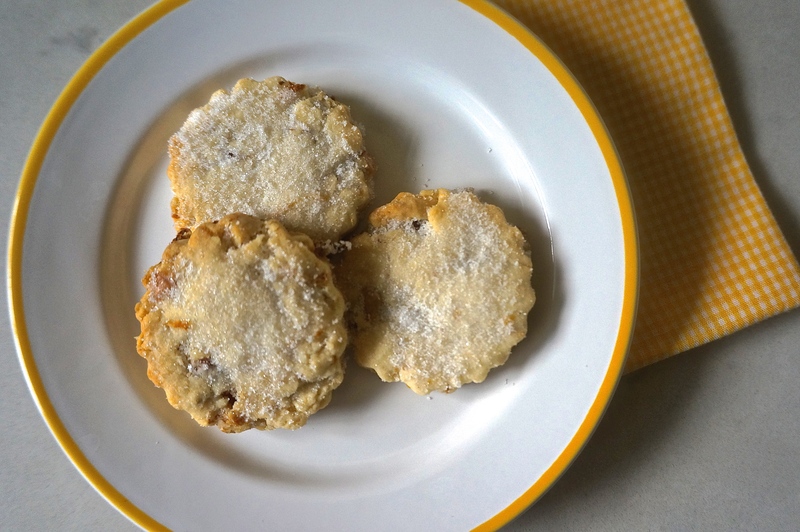 And here’s a cookie, not too sweet, with a sprinkle of sugar, the crunch of walnuts and lots of tart lemon flavor. Cookie time! 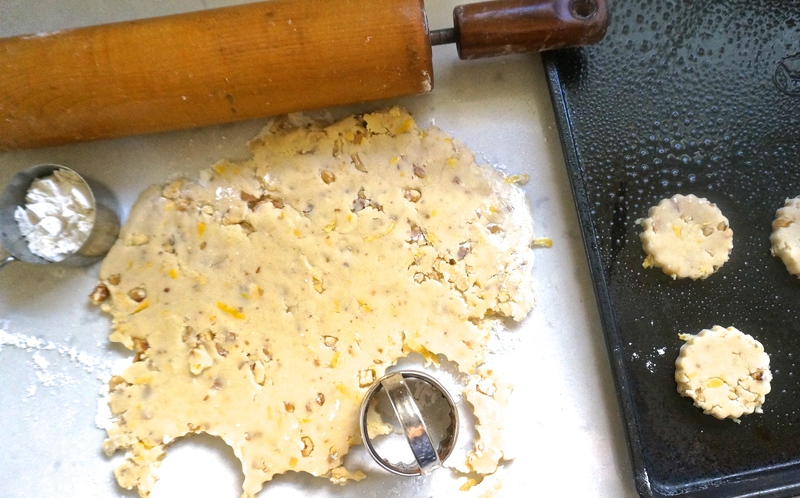 Stir together the flour, sugar, nuts and grated lemon peel. Cut the butter into bits and beat it in with an electric mixer long with the lemon juice. This will take several minutes. When the dough turns to coarse crumbs, pat it into a ball and roll it out on a floured counter with a rolling pin. Cut into shapes with a cookie cutter or knife and place the cookies onto a baking sheet sprayed with cooking spray. Pop them into a 350 degree oven for 20-22 minutes until they are browned around the edges. Makes about 2 dozen 2″ cookies. 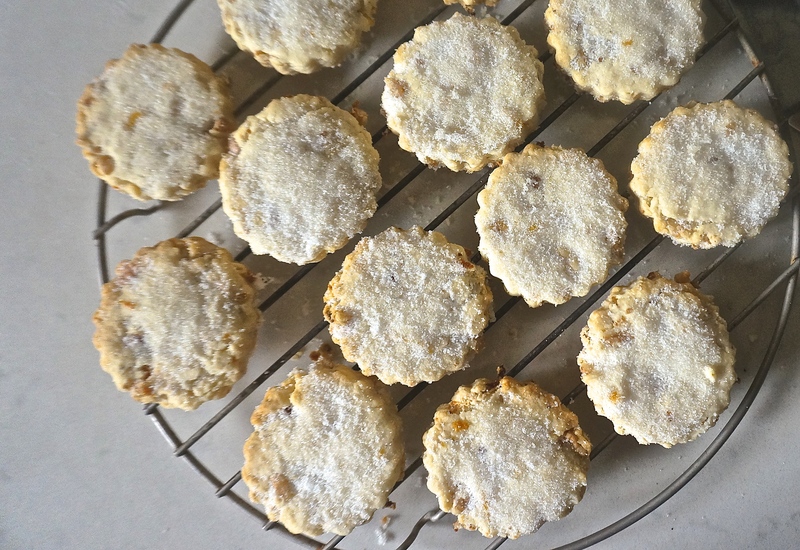 This entry was posted in Food and tagged baking, cookies, lemon, walnuts.. Bookmark the permalink. You are so right Laura– but I do manage to find so many occasions to treat myself! Oh! I really hope he loves them– you must be one of those nice baking kinds of moms! !